This trip exposed ‘German Efficiency’ as a myth, the flight was late boarding (Due to a late inbound flight, although we were not told this until after we had boarded the flight), it wasn’t the delayed flight & boarding that prompted the ‘German Efficiency’ comment, but rather after boarding Elite & Business class they wanted to board the rear of the plane first, whilst they enforced this at the gate, they didn’t clear line of those people that didn’t qualify meaning that there were people ‘in line’ who shouldn’t have been. This meant people who did qualify were joining the back of the long line, only to come forward when the exasparated gate staff called out the rows numbers they were looking for again. The plane that would be flying us to Frankfurt was an Airbus 321 (D-AISK). 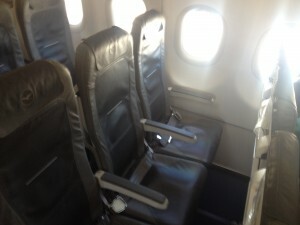 The seats were slimline and the business class seat were identical to economy except that the middle seats were blocked. After boarding was completed the pilot informed us about the delay (even the screens in Edinburgh didn’t acknowledge a delay) and that this had been caused by the inbound flight being late. 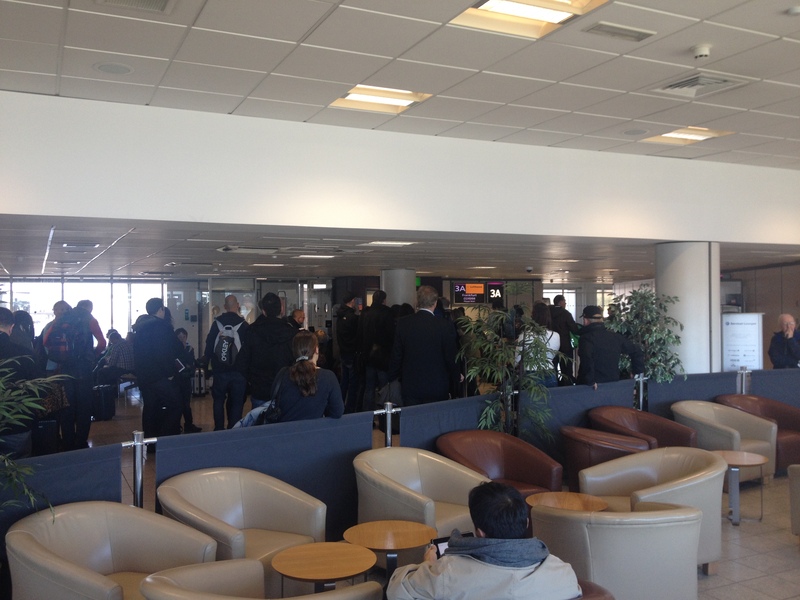 The flight crew were very good and kept us informed at key points throughout the flight. The seat was comfortable enough and sufficient room or pitch between the seats, I wouldn’t want to be in the seats for too long but for short haul they were absolutely fine. The IFE consisted of my iPad 😉 and crew were pleasant enough but very business like (some German stereotypes are true) and certainly weren’t ‘hosts’ as Luftansa would like to make out. The food service consisted of a Tomato and Mozzarella sandwich (no alternatives were offered) and a complimentary beverage, I opted for diet coke. This was served shortly after take off, and the crew gave us ample time to complete eating our ‘meal’ before collecting the rubbish. 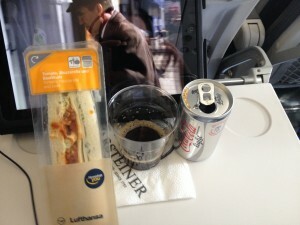 Surely Lufthansa could stretch to offering a vegetarian option and a non-vegetatian option in economy? Overall the flight was pleasant enough, nothing to scream out, always use Lufthansa for my short haul flights but nothing that would stop me using again in future. What are your thoughts? 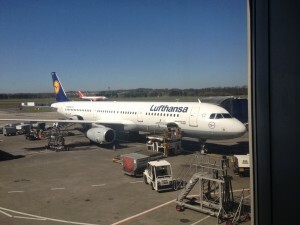 Have you flown Lufthansa for intra-Europe flights? Would you use them again? I had not booked anything for Easter 2014 (Friday 18th April to Monday 21st April) so in late March, I decided to look around at ideas for a short break, in order to maximise my time at the destination and make it back for work on Tuesday, this essentially meant a short break in Europe. I was originally thinking Rome, however the costs of flights due to the Easter break were too high for me. I have already been to Amsterdam and Budapest within Europe, this left plenty of new cities for me to explore. After having a look around at available flights and the cost of those flights, Vienna looked like the best option for me. This trip allowed me to try Lufthansa & Austrian Airways, and the American Express Fine Hotels & Resort service, which I used to book the Hotel Bristol in Vienna. Scotland’s Flyer is pleased to announce that he will be taking an upcoming trip to Vienna. And staying at Hotel Bristol (leveraging both the American Express Fine Hotels & Resort service and also my Gold level SPG status), I will let you know how that works out during the trip report. The hotel was named after the British town Bristol. In Vienna it was disproved for the first time that the Bristol had been named after the fourth Earl of Bristol. The Earl lived some 100 years before the opening of Europe’s Bristol Hotels (Rome 1870, Warsaw 1901, Oslo 1920, Paris 1925 and some 50 more), his emblem was totally different from that of the town in Suffolk which has nothing to do with the Earl. Bristol’s emblem depicts a castle and a ship. Bristol, after all, was the town from where many expeditions put out to sea. The original unicorns were displaced by lions in 1923. Later, in 1932 and 1975, the unicorns appeared again. Today, the emblem bears the lions once again. The motto Virtute et Industria, virtue and industriousness, can be read above our hotel’s entrance door; it is, in fact, the same motto that decorates the emblem of the town Bristol in England. Have you been to Vienna? Let me know in the comments section what hints & tips you have so that I and other readers can benefit from your knowledge. Are you looking forward to my trip report or should I only review trips where I travel Business Class or above? Let me know in the comments section.